A quick view of the most influential metrics in Sorrento Valley. The neighborhood of Sorrento Valley is located in the city and county of San Diego, California. In the beginning the community was zoned primarily for industrial use but today it is home many residents and features three major family home and condominiums developments. This is an affluent community with a median income of approximately $102,391 a year. The community is a center for scientific research and has several biotech, IT and high tech businesses. The local economy rests on these businesses, which include but are not limited to Optimer Pharmaceuticals, Qualcomm, Websense and as of 2013 even the FBI came to call Sorrento Valley home. The FBI inhabits a six-story building with approximately 400 agents and their support staff. The community of Sorrento Valley is a part of three community planning areas, Torrey Pines, Mira Mesa and University. According to city-data.com, whose information dates from 2011, Sorrento Valley spans 7.723 and his home to 5,277 residents giving the neighborhood a population density of 683 people per square mile. The majority of the community’s workforce works within the community. But for those that travel outside the community, downtown San Diego is only 15 miles away. The community has train service from Coaster commuter and Amtrak Pacific Surfliner rail lines. 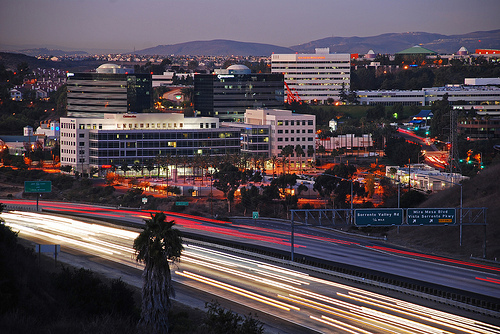 Both I-5 and the I-805 freeways pass through the edge of Sorrento Valley, this along with the rail lines make it easier for residents to commute. Public education for the children of Sorrento Valley is provided by the San Diego Unified School District. Sorrento Valley has limited park space, but there are open undeveloped areas still available. However, the community does lie right next door to the Los Penasquitos Canyon Preserve. The preserve spans seven miles, features over 500 species of flora and approximately 175 species of birds. There is a Sorrento Valley entrance to the preserve making it quite accessible to residents for hiking, nature observation, picnicking and more. This community is still developing and unlike many San Diego neighborhoods has not reached its build-out point. Housing within the community is primarily upper-middle class or better structures and features single family homes, luxury apartments, town houses and condominiums. The majority of these homes are located the numerous, stylish developments that are almost sub-communities. These homes feature a variety of amenities, landscaped yards and most importantly they lie along quiet streets with low crime and wonderful employment and education opportunities. Contact local real estate agents for assistance in finding a place to call home in wonderful Sorrento Valley. View our selection of available properties in the Sorrento Valley area. Check out the latest demographic information available for Sorrento Valley. Learn more about schools near Sorrento Valley complete with ratings and contact information. Browse through the top rated businesses in the most popular categories Sorrento Valley has to offer.